I've eaten at The Tennessee Truffle in downtown Sanford three times now. There's a reason I keep coming back, and that's excellent and adventurous food, with local, fresh ingredients, done right! 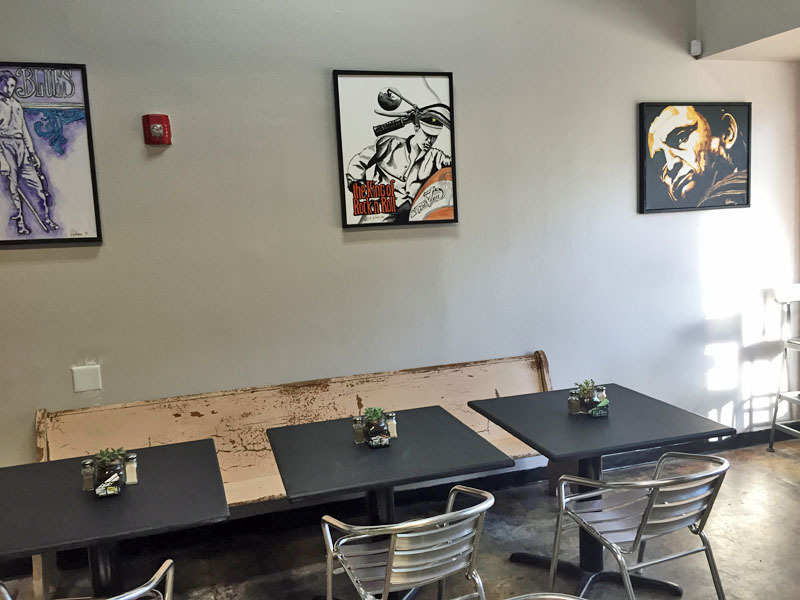 The Tennessee Truffle is Sanford's first "pop-up" restaurant--the idea is to pop up a new concept restaurant quick and easy for 30 days, and see what happens. If it takes of, then it'll be around a lot longer. But, if in 30 days it flounders, well then time to move on. Based on my experience there, I hope they're around for a lot longer than 30 days, I really liked everything I've had there. More about the concept later. 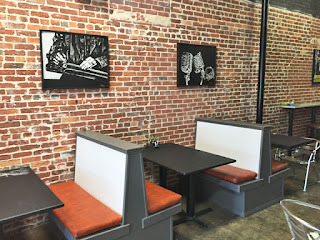 My first chance at tasting their food was even before it opened--I was invited to write a blog about it on the Sanford365 blog. Lucky me, because it was great and I got a personal preview. Read that article for more. It was so good, I had to go back--on their second day open! I went for lunch and thoroughly enjoyed it. I had the pork loin sandwich on a biscuit and potato salad. I added on a side of collard greens as well. The pork loin was excellent, tender and juicy, not dry. it was topped with a marmalade or chutney made with sweet onions and applesauce--the perfect balance for pork. I will say that eating a sandwich on a biscuit is a bit of a challenge--the biscuit was very tender and flaky. But it was oh, so good. My potato salad was light and refreshing, red potatoes dressed with some mayo and just a bit of red onion and red bell pepper. Truly delicious. The collards as well were very good with nice chunks of what i believe were duroc pork--they were tender and flavorful. 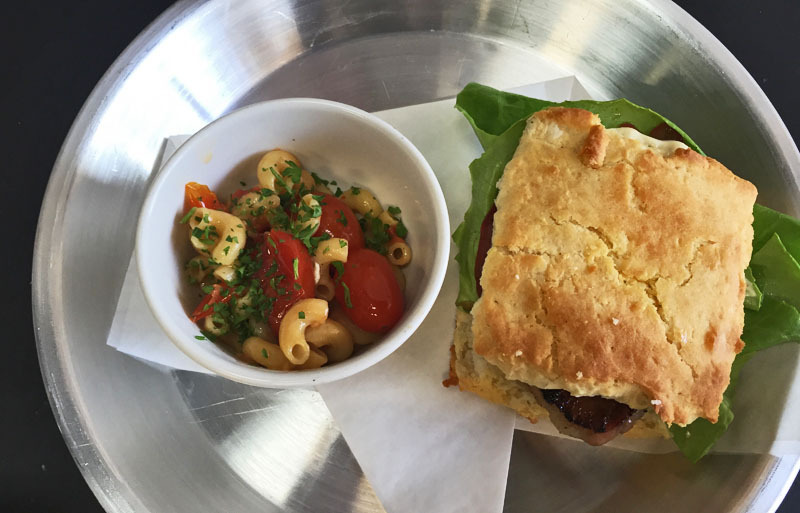 Tommy had the BLT, but not your ordinary BLT. The bacon was duroc pork. He found it a bit salty and a bit hard to eat on the biscuit. The lettuce and tomato were very fresh. To go with he had a warm macaroni and tomato salad. This was an unexpected and pleasant surprise. It was very, very good! 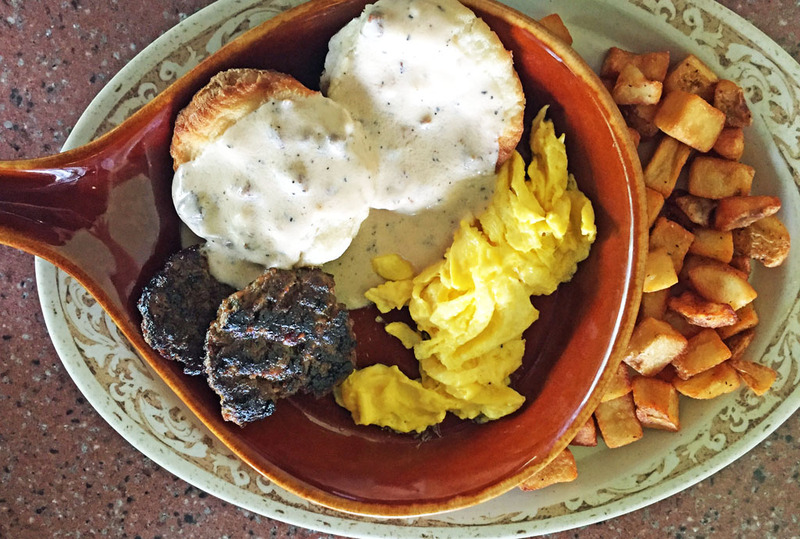 On our second trip there, I went in specifically for one thing: the Sausage Gravy & Biscuit. I was not at all disappointed. 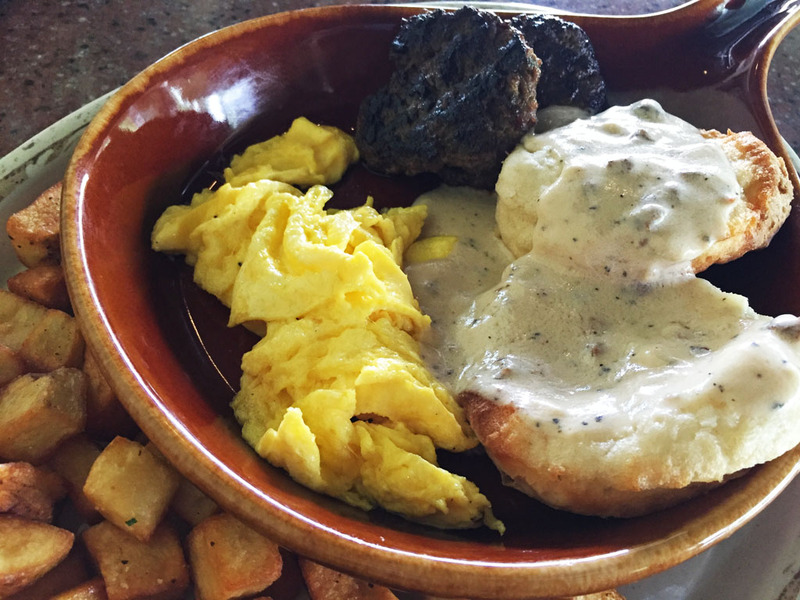 This may well be the best sausage gravy and biscuit I've ever had! Ever! First off, the biscuit was exquisite, large, tender, flaky, buttery--just a lot of goodness.The gravy was packed full of very flavorful sausage and had a hint of fennel in it. This was a perfect counterpoint to the chervil that graced the top of the dish--it added that over-the-top element to what was already a great dish. I could easily find myself addicted to this dish, it was that good. Along with this I ordered a single egg, over medium. It was perfectly seasoned and cooked perfectly. Tommy had two eggs over medium and some toast which he really liked. He also had some local honey over the toast and that was a big hit as well. I'd certainly go back, and there are a few other things on the menu that i really, really want to try. 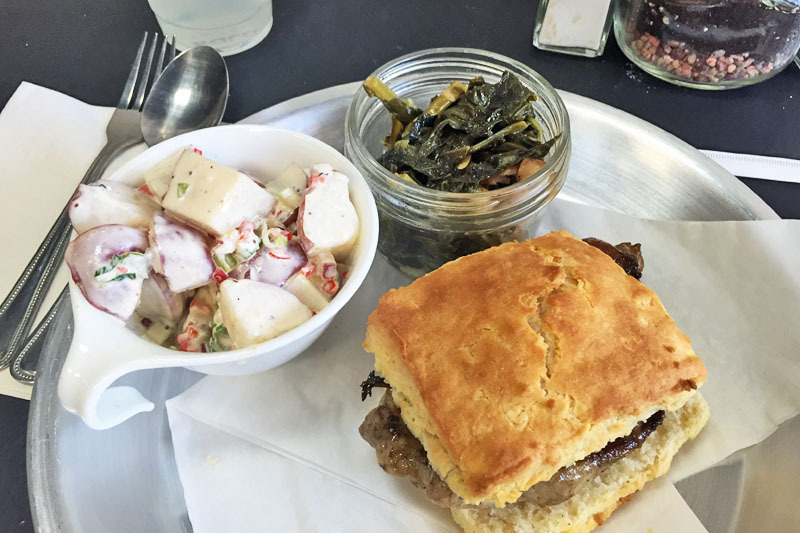 The concept of The Tennessee Truffle is true southern cooking. Chef Nat Russel grew up in Tennessee and the restaurant gets its name from pickled ramps (made in-house) which in Tennessee is known as a Tennessee Truffle--now you know the rest of the story. They specialize in locally sourced, organic, and fresh ingredients and the menu may change based on availability. On the preview day, I had the privilege of sampling five other dishes as well. I started off with the creamed corn, made in house with fresh Ocoee corn, some pickled ramps (the Tennessee truffle), and a dash of espelette, an mild pepper. Excellent. After that it was on to the Ansen Mills Grits, a really outstanding dish and probably the best grits I've ever had. We moved on to some roasted baby carrots (yellow and orange) served with a sort of whole grain mustard and tarragon sauce. Again, a hit. 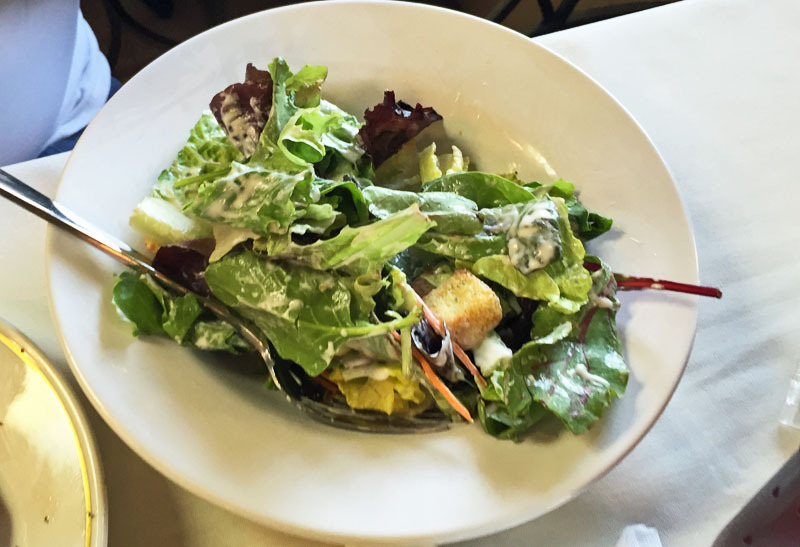 Then it was on to a Bibb lettuce salad that was very fresh and had a great dressing. We finished with a Chicken Salad--more fresh, what more can I say. Tennessee Truffle is the brain child of Nat Russell, formerly an executive chef at a fine dining restaurant in Winter Park. He sees the potential and has taken a risk. From my view, he's made a great choice and Sanford is lucky to have him. I hope he's around a lot longer than 30 days, but is suggest you run there now (Tuesday-Saturday, 7:30 AM to 2 PM) and not chance it! I have to confess that I visited Nathaniel's Steakhouse and did not try the steak. I'm sure that is my bad. But what I did have was a pretty decent meal. 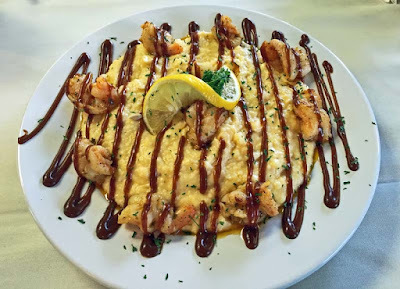 Being a big fan, I had to try the Shrimp N Grits. It was pretty good. The grits were nice and creamy, I liked them a lot. The red-eye gravy that was squirted on top was tasty, but I'd have liked a bit more of it. The shrimp were average, nicely seasoned, but cooked maybe 20 seconds longer than they needed to be. Decent, but not over the top. All in all, it was pretty decent. Tommy had the smothered chicken breast with homemade mashed potatoes. First of all, the potatoes were really excellent, they sure tasted homemade, were nice and creamy, and full of flavor. 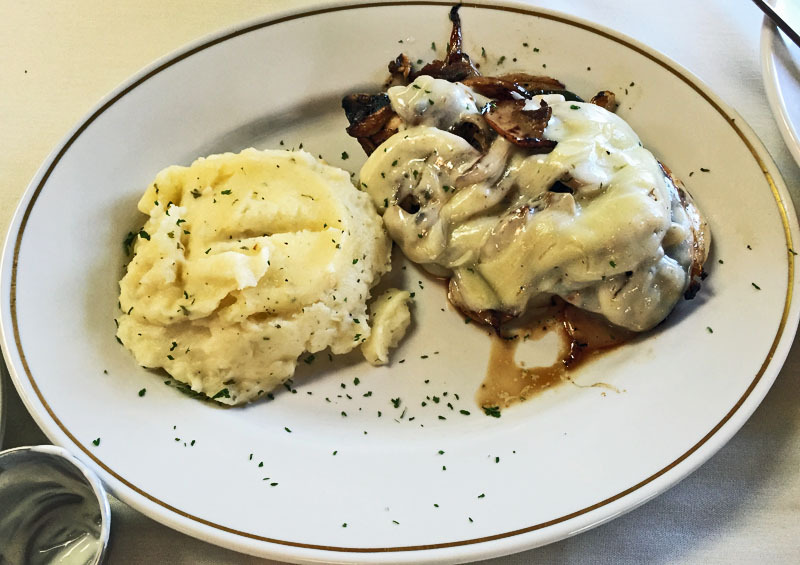 The tender breast of chicken was smothered in onions, mushrooms, and cheese, and it was very good as well. I'd go back just for another bite of those mashed potatoes, though. Tommy also had a salad to go with his meal, and it was a nice, decent salad with fresh greens and more than just iceberg. Throughout, out waitress was attentive. At one point Nathaniel himself (namesake of the restaurant) came over as well. It was a decent meal. It's a large place and i got the impression that they were not quite finished with it. I hope they do well. YOu should give them a try and leave a comment! 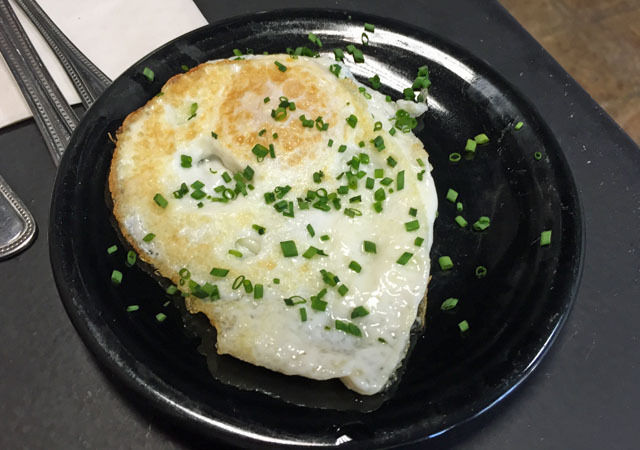 I was attending training at a facility across the street, and decide to give Another Broken Egg a try for lunch. However, I did have breakfast on my mind, and so settled for the Classic Biscuit & Gravy. This was homemade sausage gravy over a split biscuit. Mine was accompanied by two eggs, scrambled, two patties of house made sausage, and served with seasoned country potatoes. 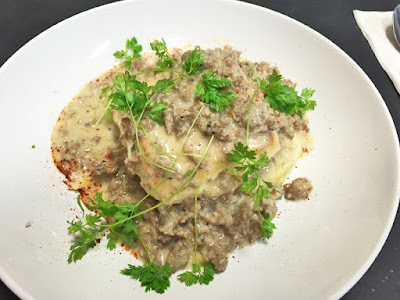 First of all, the sausage gravy, the star of this dish, was very good and tasty. It was all a sausage gravy should be with not too many other flavors to mar it. My only complaint is about the portion--it was not really enough to go along with the biscuit. But what there was of it was quite tasty. The biscuit itself was very light and fluffy and very good. The sausage was also excellent and had a great flavor--definitely a huge step about the frozen stuff from a grocery store. The seasoned potatoes were OK, though nothing over-the-top special. Overall, I enjoyed my meal here and thought is was a decent value at just under $10, if only there had been a bit more of the delicious sausage gravy. 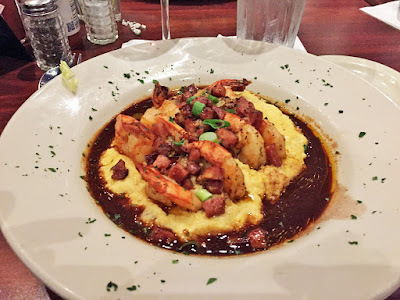 We ate with friends at Tibby's New Orleans Kitchen recently and were impressed. The Shrimp & Andouille Cheddar Grits I had were outstanding, among the best I've ever had. First of all, presentation is king, and this was a nice presentation. Creamy, cheesy grits were surrounded by red-wine gravy. There were about 9 shrimp on top, and they were cooked perfectly. The dish was finished with a bit of andouille which gave it a nice bite and a bit of heat. The red-winegravy was nice and tangy with a deep rich flavor. And the cheddar grits? Quite creamy and tender, not at all starchy with a nice cheddar cheese flavor. This was a hit for me and I'd order it again and again. 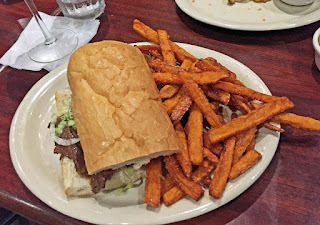 My friend Tommy had the half-size 12-Napkin Roast Beef Sandwich. I'm not sure he needed 12 napkins, but the roast beef was plenty tasty, though just a bit chewy. The fries were absolutely outstanding. It certainly was a bit messy, just as promised. We'd started out with some fried pickle and found them to be very good, not over-breaded, nice and tangy, with a tasty remoulade. We were here with friends and we all agreed that this was a great meal--we'd all return again! Well, the wait is over, and Fuel BBQ in Historic Downtown Sanford have finally opened....softly. First of all, my verdict...and that is....outstanding 'cue! Top notch. Best BBQ. But now that the excitement and anticipation of what I think is over, let me elaborate. I saw on social media thatFuel had opened on Thursday, April 28th. Not wanting to rush things, Tommy and I headed over there for dinner early on the next afternoon, Friday the 29th. The wait was not bad at all, but the bad news was that the Beef Brisket that had Tommy excited was 86'd--they were out. No Brisket! So, Tommy ordered the BBQ chicken half and I had the ribs, a half rack, but a large half rack. The ribs? Fantastic! They were easy to pull off the bones, but still had a nice texture, full of flavor and moisture. The ribs were dry in that they had only a dry rub on them, but were still juicy and flavorful--I only aspire to make ribs this good. 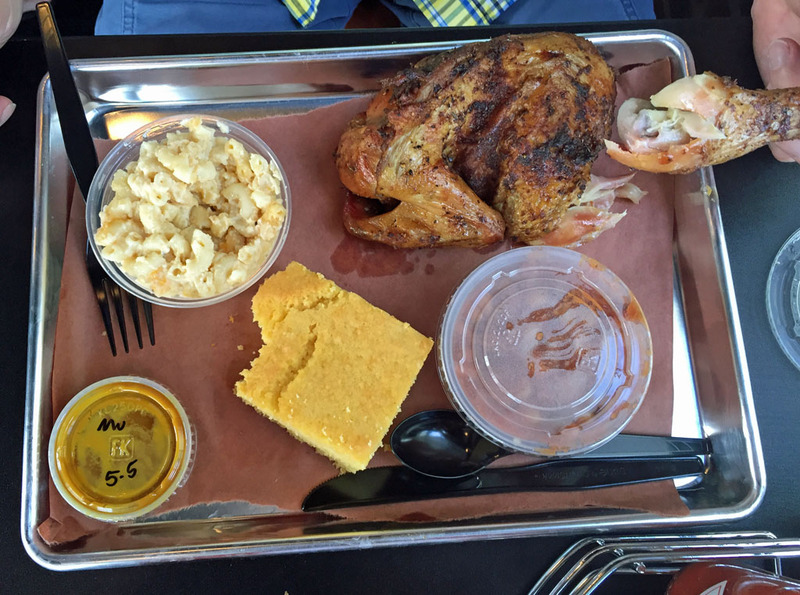 We both had BBQ beans for a side, he had the mac n cheese, i had coleslaw, and we also got cornbread. Read on for the details. My ribs are pictured to the left. Then on Sunday May 1st, we headed over again for lunch with friends, during the St. John's River Festival of the Arts. We all ordered the Brisket. OMG. It was like butter. Let me be specific--best brisket I've ever eaten, no doubt. Top of the line. Out of the world. So fantastic. 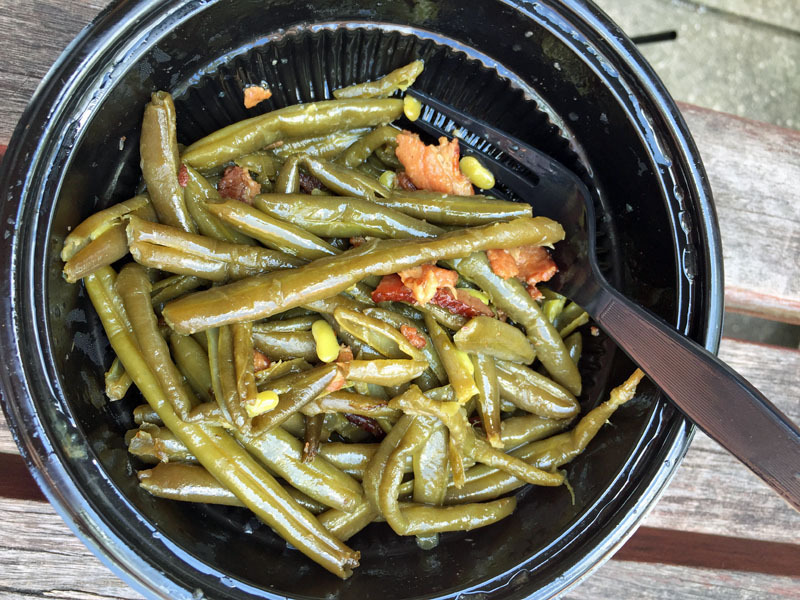 I also had the green beans, and Tommy again the Mac N Cheese. So, now for the details. The picture at right is a poor representation of the brisket. It was like butter. But butter with a nice bite to it, with some pepper and other great flavors. 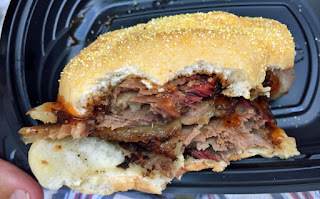 The brisket was absolutely perfectly grilled/smoked....it needed no sauce at all and was tender and flavorful. I could eat this brisket all day. All four of us had the brisket sandwich, and we all loved it, no doubt about it. It's the stuff of dreams. We all agreed that it was superb, excellent, and whatever other flavorful superlative you want to choose. So far, score for brisket, score for ribs. Now on to the rest. The first night there, when they (on their soft opening) were out of Brisket, Tommy went for the half chicken. It was salty. Even when you pulled the skin off, and though it had a nice flavor, it was just too salty--over brined, I think. It has potential, but they have to work that out. But there is good news in here. The cornbread was OK. The beans were OK for me--maybe a bit too much tomato, not enough smoky/BBQ flavor. I think they need some work, maybe some brisket or pork end pieces in them, just something to kick them up a notch. They weren't bad, just not "over the top. The Mac N Cheese was very good, no doubt. And my coleslaw---yes, very good, though just a tad dry. And as for my green beans....well, as one who grows and cooks his own, I'd say these were very good "southern style" green beans--that is, they are cooked a lot and very soft, but also with a load of flavor. So, as i mentioned we were there--two times--during their soft opening. I have no problem with slightly slow service (though they were working hard) and a few missteps during a soft opening--and they did very well. When we sat down, we were checked on a few times and if we asked for something or about something, the response was instantaneous. For me, I think the flow of operation will just take a bit of time to work itself out...they are working hard, trying hard, very busy, and have an excellent product to back themselves up with..top notch. Now, i have not yet tried the pulled pork, but i'll be back, and soon, to try that. I cannot wait for the pulled pork! There was one mishap, and i witnessed it twice, though they quickly recovered from it. On my first visit, when trying to add or rearrange a hotel pan full of mac n cheese to the steam table, it fell into the water bath. Unfortunately, there was too much water in the steam table and it got a dose of water in it... so much for the mac n cheese. But on my second visit, i witnessed the same disaster with a hotel pan full of pulled pork. I felt very bad for them, but was impressed by the recovery--I heard someone in charge of the kitchen giving orders to all kitchen help to stop what they were doing and get some pulled pork out ASAP, and it appeared in minutes! My hat is off to people who know how to get results, and they did. But they need to learn to put less water into the steam table--these disasters could have been mitigated--less water, just check on it occasionally, the water is there for the steam, hence the name "steam table." They'll learn, it's a hard lesson. Yes, this is a long post. But i am passionate about at least two things in life... good 'cue, and Sanford. 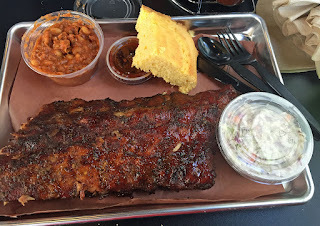 Fuel is the marriage of both things, IMHO....it is great BBQ (from my ribs to my brisket) and a great addition to the dining scene in Sanford, which already boasts a lot of great restaurants and bars.. So, my advice to you is to run, don't walk, to Fuel in Historic Downtown Sanford. Give their homemade sauces a try (so far so good), but come for the brisket or the ribs, no doubt. You will not be disappointed and you will not leave hungry. Remember, they are still in their "soft opening." If it's this good for a soft opening, what will it be like when they have some time and experience under their belts? I am betting on superb food and experience. I am so expecting that is will be the best BBQ in all of central Florida--maybe even in the south!